Please find a copy of the'Notice of Polling Districts and Polling Places review' from Cornwall Council. Save the date! For a very special celebration of Elmer's 30th Birthday we will be holding an Elmer Party day on Wednesday 29th May 2019 at Lostwithiel Library. Please see the notice below for details of how to apply for the vacancy at Lostwithiel Town Council as a Town Councillor. Lostwithiel Library is now open. Week 2 of the Library Refurbishment. The refurbishment of Lostwithiel Library is underway - please see photos below. 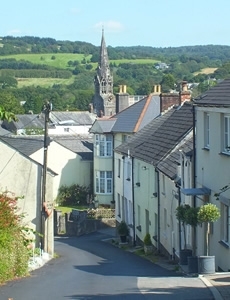 Lostwithiel Town Council is delighted to be able to advise that the Lostwithiel Neighbourhood Plan referendum will take place on Thursday 21 February. Please find more information at the Neighbourhood Plan website (linked below) and also the Information Statement attached to this news item. The Information for Voters will be included in the next news item. 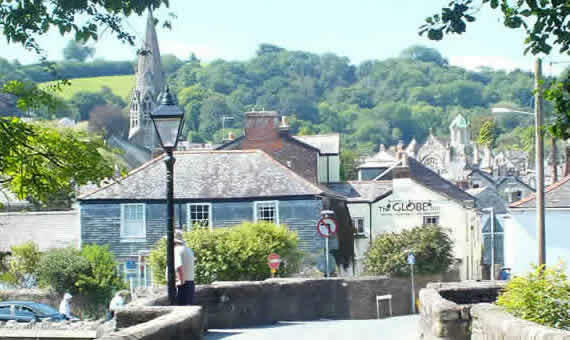 Lostwithiel Town Council is delighted to be able to advise that the Lostwithiel Neighbourhood Plan referendum will take place on Thursday 21 February. Please find more information at the Neighbourhood Plan website (linked below) and also the Information for Voters is attached to this news item. The Information Statement will be included in the previous news item. Please find below an advert for volunteers at Lostwithiel Library. Please follow the link below for information on the Pocket Parks Plus scheme. The closing date is Friday 25 January at 5pm. 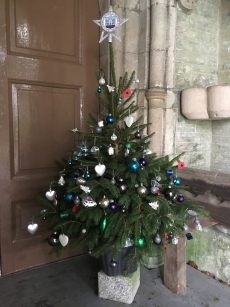 Please be aware that the Lostwithiel Town Council office will be closed over the holiday period between Thursday 20 December 2018 at 5pm and Tuesday 8 January 2019 at 9am. Please see the attached PDF for details on the transfer of Lostwithiel Library to Lostwithiel Town Council. Please see the poster linked for details of rubbish collections by Cornwall Council over Christmas and the New Year. 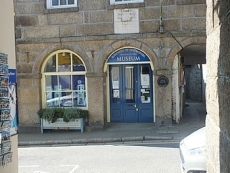 Congratulations to Lostwithiel Museum having been awarded the 2018 Cornwall Heritage Awards Judges Special Award in recognition of their pro-active approach and their many creative projects. This year marks the 100th Anniversary of the end of the 1st World War. Therefore, the services this year will differ slightly from the usual programme. There will be a Parade and Service on Sunday morning and a second service on Sunday evening at the War Memorial. Please see the poster for more information on times and locations. The six-month trial allowing dog owners to use the King George V river bank area will run from 16th October 2018 – 16th April 2019. The Council sincerely hopes that this shared space initiative can be extended at the end of the six-month period. 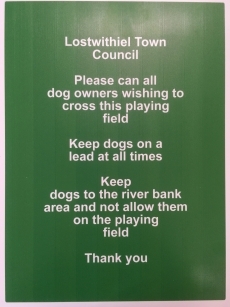 Can all dog owners please follow the instructions on the signs and can all members of the public provide feedback to your Town Councillors and/or the Town Council office. Please visit our new Contacts Page! 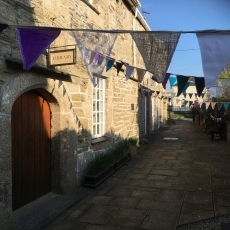 The Old Carriageworks, 3 Brunel Quays, Lostwithiel, Cornwall, PL22 0EN A private discounted sale home is available for sale and being advertised through the Help to Buy South West website Please follow the link below to see a copy of the advert. If you are aware of any households who may have a local connection to your town and would be interested in this property please advise them to register with Help to Buy South West. The pre-feasibility report on Edgcumbe House was considered by Council at Tuesday’s meeting and Council has taken the decision to progress the project by exploring funding opportunities for the next Feasibility stage. The Pre-feasibility report is available below. Please see the link below for details of the new Armed Forces and Veterans Breakfast Club. Poster Armed forces and Veterans Breakfast Club. Poster Armed forces and Veterans Breakfast Club. Please have your say on the draft recommendation for Council division boundaries for Cornwall. The consultation closes on 17 September 2018.